So I am announcing the planned release of 8bit-Unity in the second quarter of 2019. 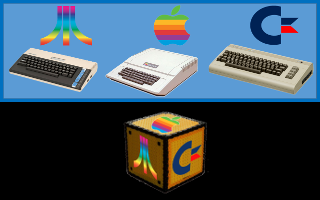 The SDK will contain everything to let you create simple online 8bit games in C code once, and deploy on all supported platforms easily (C64, Atari XL, Apple//e, and more in future such as the Atmos!). Congrats! This is really a remarkable event in the 8-bit universe. I like the idea for universal game API. I'll try the Apple// port with emulator asap and of course the Oric one when it's ready. Thanks for the positive energy ISS! This is going to be a multi-year project, with loads of future milestones such as more platforms, and more API functions (for things like tiles and scrolling). This looks like an effort intensive project indeed given how varied the 8 bit ecosystem was/is. Have you had a look at the existing similar setups (the OSDK obviously comes to mind) so as to evaluate what kind of features you would have to add in order to keep users happy? I know the 8 bit Atari scene already has quite a lot of tools available and I can imagine they would be picky. In any case, I wish you endurance and persistence.